When you step over the threshold of the warm & cheery Goshen, Indiana apartment that houses The Tympanum Press, you find yourself surrounded by the delicate smell of ink, the intoxicating jingling laughter of Amy & Richard Worsham’s daughters, and a Kelsey set-up lovingly in the living room (next to the accoutrements of a shop that’s steeped deep in family printing traditions). 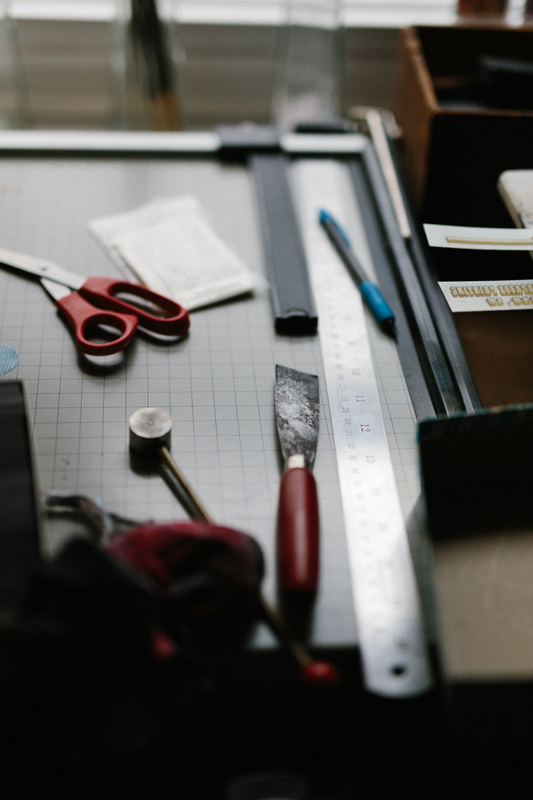 We sat down with the husband-and-wife duo to talk shop, printing at home, and the joys of leaving the house with relatively clean fingernails. HOME-STYLE PRINTING I’m Amy Worsham from the The Tympanum Press. My background is in graphic design, with experience in bookbinding and paper making. I homeschool our two youngest girls and operate our press out of our home in downtown Goshen, Indiana. THE INK RUNS DEEP My husband has printing ink in his blood. 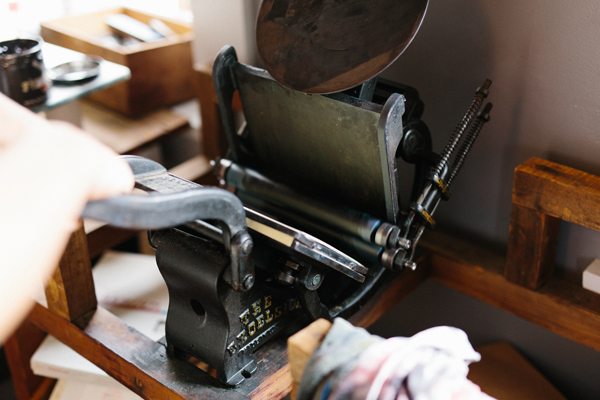 His great-grandfather took to printing early in life and as a boy earned enough to pay for his small press and buy a bicycle before leaving school. He went to work for Joseph Bryan, a prominent Virginia newspaperman, who shortly after acquired the Richmond Times. He was sent to New York by Bryan to learn the operation of the linotype machine and met its inventor, Ottmar Merganthaler, in Baltimore on his return trip. In 1892 he set up the first linotype machine in Virginia, and eventually went on to found the Richmond Press, which he ran into the 1940’s. We still use the Kelsey Excelsior that he bought for his son, Richard’s grandfather, who in turn ran it as a job press for many years. In 1998, Richard trained under Walter Clements at the Rugby Print Works and had been running the press since then on small jobs for friends and family. We started working together shortly after we were married to bring in a little extra money while we were still in college. We didn’t advertise and considered ourselves mostly a hobby press, but were amazed at the interest in our work. Graduate school drew us to South Bend, Indiana in 2009 where we decided to open as a job press. Since then, we have gradually expanded our portfolio from business cards and invitations to everything from broadsides to even small books. CLOSE TO HOME Our print shop has always been run out of our apartment. We have our old reliable Kelsey 5×8, so we’ve always managed to set aside a corner of our living space dedicated to our press. Recently the area needed for our press space has increased as we’ve expanded our line by taking in more jobs from online sales sources like Square Marketplace and Etsy. Our current workspace is what some might call a living room. The press, tables, shelving, and equipment take up most of the space, but since both Richard and I are self-employed, we don’t have much time for lounging around anyway. It is truly amazing how much can be accomplished with the right attitude and well-made equipment, no matter what size. DESIGNED TO PRINT My background is in graphic design. Richard takes the side of the cranky printer, and enjoys setting in cold type with a light impression, while I have brought the adaptability of digital design and graphic arts training to our letterpress process. Our goal is to pair the tradition of printing with modern techniques and create things that remind us of the power of the printed word. THE CREATIVE PROCESS Depending on the project I’ll either grab a pencil and start sketching or go straight to the computer. For many of our cards and graphics I use Adobe Illustrator, but I also do a good number of linoleum block cuts on or off the press. For custom projects, I like to start with a number of precedents, honing it in with a pencil and paper, and finally moving to the computer for a final pre-proof design. 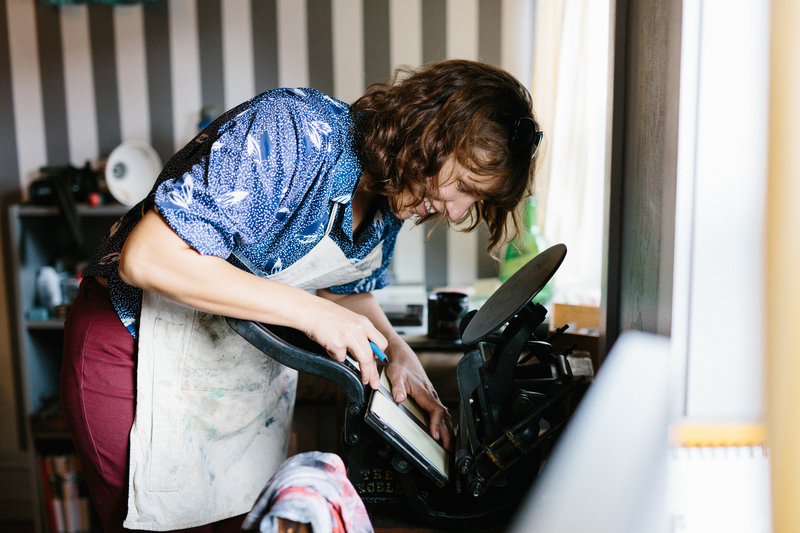 FULL TIME FUN Since starting the Tympanum Press, we have transitioned from small jobs, mostly for fun, to part-time job printing, to regular work, but in the last year it has become a full-time operation for me. As orders continue to come in, we are looking for a larger press and additional equipment, as well as space outside our home. It is amazing how far we have come operating the press just like those old advertisements promised in the 20’s. PRINTING FEATS Gosh, this question is tough. Sometimes in our hectic schedules mixing the perfect color is an accomplishment… Sometimes leaving the house with relatively clean fingernails is an accomplishment! 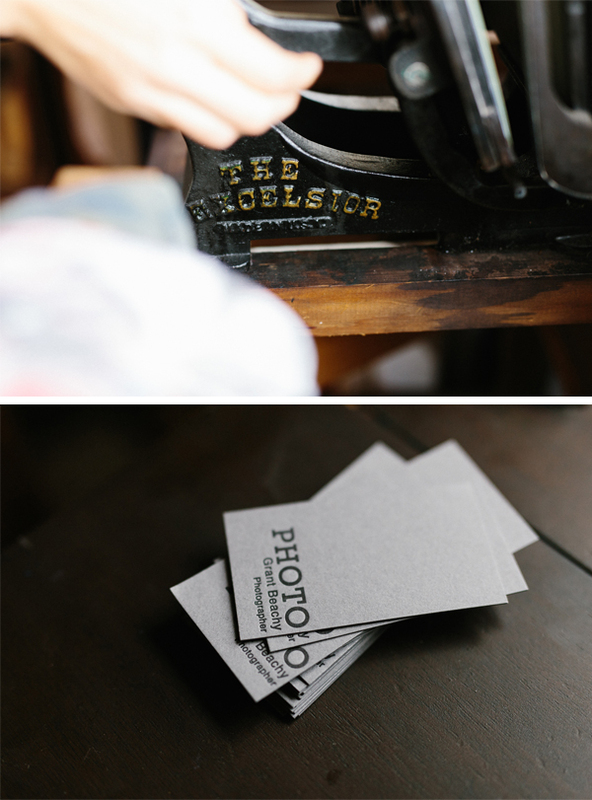 PRESS HISTORY We’re still printing on our very first press, the reliable 5×8 Kelsey Excelsior. Richard was trained on a Pearl and we are definitely looking for a larger floor press. We never had the space since we’ve always printed out of our home, but since we’ve gone full time I am very excited at the hugely expanded potential of a larger press. BOXCAR’S ROLE Photopolymer plates, especially with the Boxcar Base, have allowed me to tailor our printing to our community and combine my love for design with the versatility of letterpress. Boxcar has allowed me to create a cohesive line of products within my budget. 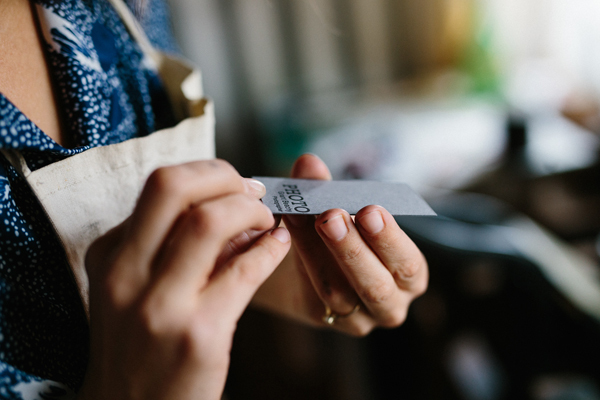 SHOP TIPS Never rush a print job. Take your time. When nothing is working, clean it all up and start again. WHAT’S NEXT 2015 is going to be a great year for us. 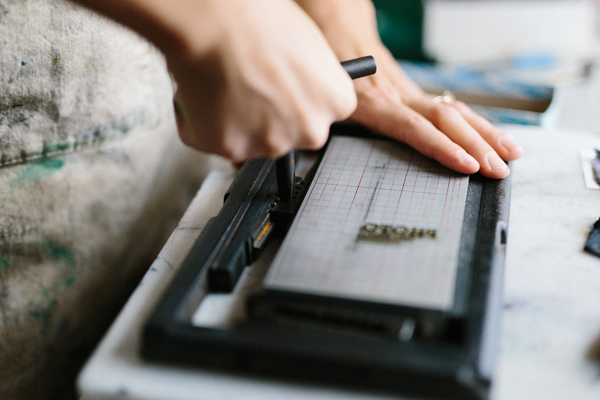 We’re not only investing in a larger press and plenty more lead type, but we also have big plans for much more platemaking through Boxcar as way to get many of our customers the types of stationery styles they are looking for. Huge heaps of thanks out to Amy and Richard for letting us take a sneak peak into the wonderful world of The Tympanum Press! This entry was posted in Printer Profiles, Shop Talk and tagged Kelsey Excelsior by Cathy. Bookmark the permalink.